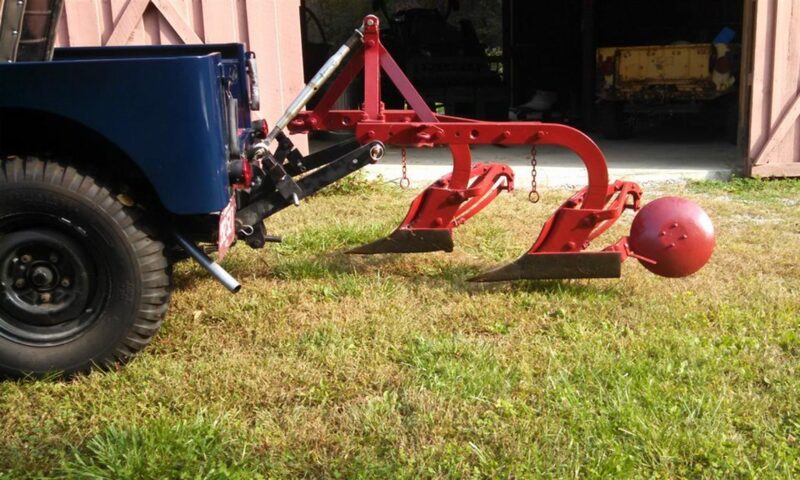 The Brown County Antique Machinery show is held the first weekend in May each year. We have been trying to make that show for the past several years, but have never been quite prepared. We aren’t finished, but we are going to take Blue on a road trip “as is”. Blue is running and even though we are planning to change the motor, it is road worthy. It lacks a working hydraulic pump and the cable to control the governor. At least people can see a real Farm Jeep. The first task was to install the PTO shaft. This is normally a very simple job, involving installing and bolting the rear shaft flange on the gear box and bolting the shaft in place. A some point, the splined shaft on the rear of the gear box had been damaged. The gear box had to be removed and the bolt hole had to be re-tapped. So the normal 30 minute job turned into a 3 hour task. 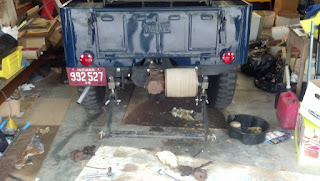 The gearbox turned easily, so we filled it with gear oil and started the jeep. The PTO worked perfectly. Except for a small leak on the back of the box. We will need to remove the box and see if it is a quick fix or a tear down. Several years ago, we find a Willys belt pulley assembly on e-Bay. It was mis-identified as being for a tractor, but we had done enough research to know a Jeep pulley when we saw one. It was a paper pulley, instead of the more common steel type, and it had to be rebuilt. There is still a company – www.paperpulleys.com – that rebuilds paper pulley drums and we had them build a pulley using our frame. The drum has been sitting on a shelf for a few years. The pulley gear box had been on the shelf too and we decided to just clean it off and install it as a show item. The assembly was a simple bolt-on process and the drum turns freely. We need to paint the gearbox, but that can wait. 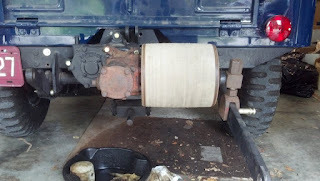 In the picture above, you can see the lift arm to the right of the drum being held in place by an original adjustable link. The second link is rusted solid and will need some work. For this show, we have used the reproduction links we had on hand. This should at least give folks a idea of how the lift operates. good read. I would say when giving advice to self pleasure to the bible you should recommend passages from Songs of Solomon. Some of that is pretty graphic.